Violence, poverty and crime threaten the well-being of vulnerable Mexican families and children. SOS Children’s Villages supports these families so that they can stay together and also provides care for children and young people who have lost parental care. Most recently, in September 2017 two earthquakes caused further suffering as thousands of homes and livelihoods were destroyed, SOS Children’s Villages provided immediate assistance. Children in our care taking part in a creative workshop in SOS Children’s Village Comitán (photo: SOS archives). The Republic of Mexico is home to 127 million people. The capital Mexico City has around nine million inhabitants and is one of biggest cities in the world. Present-day Mexico is a country of extreme contrasts of poverty and affluence. Although Mexico has one of the largest economies in the region, around 46 per cent of the population is poor. In the past, most poor people lived in rural and isolated areas. However, there has been an increase in the number of people moving to cities to look for a new life. Currently 80 per cent of Mexicans live in cities. But, unfortunately, cities do not always offer new opportunities, and nowadays around 70 per cent of poor people live in urban areas. Regional wealth disparities and significant income inequalities also remain evident: living standards in the northern states like Nuevo León are much higher than in the southern states of Oaxaca and Chiapas are marked by extreme levels of poverty. These differences are also visible in access to services and health treatment. For example, if you live in one of the more deprived states you are likely to die four years earlier than if you live in a more developed state. Due to rising violence, the security situation in Mexico has deteriorated over the past few years. In 2017, there were more violent killings than at any point in the past two decades. In some areas there is no security, especially in poor and rural areas. Levels of violence are particularly high in the northern border region, which has served as a strategic drug-and-human-trafficking hub. Domestic violence remains an issue in Mexico: seven out of every ten children have experienced intimidations or physical and sexual abuse. Physical punishment by family members has a dramatic impact on a child’s development. In 2014, a new law was passed to protect children and young people, however more needs to be done to raise awareness and change attitudes towards the rights of children. Violence against women is also high – around 66 per cent have experienced sexual, physical or emotional violence at home, in school, at work or in public spaces. Learning to do circus tricks! SOS Children’s Villages makes sure children can enjoy their childhood in safety (photo: SOS archives). Education is compulsory until the age of 14. Although the majority of children enrol in school, many do not actually attend. A recent UNESCO study showed that around 651,000 children between the ages of seven and 14 drop out of school. Among the most affected groups are children from poor families, those in rural areas, those from migrant farm workers and indigenous families. The number of children who are forced to work is also very high. A study carried out in 2017 found that some 3.6 million Mexican children and young people under 17 were working, often in difficult or dangerous situations. Most of these children are not paid for their labour as they are contributing to the maintenance of their families. The high infant mortality rate is also a cause for concern. The number of children who die before they reach their first birthday is especially high amongst the indigenous population, who often have difficulties accessing the health system. 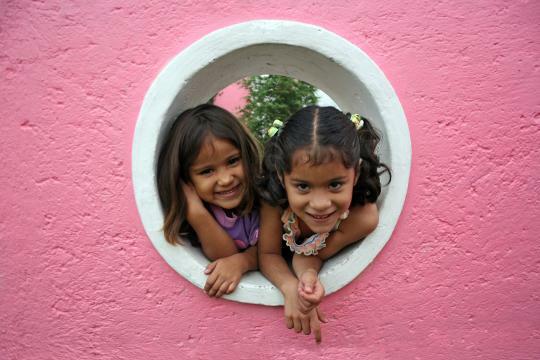 SOS Children`s Villages has been supporting vulnerable children and families in Mexico since 1971. Strengthen families: We work with local partners and the community to help families stay together. We make sure that vulnerable families have access to basic goods and services such as health care and education. Care in families: If, in spite of all support, children are unable to stay with their parents, they find a new home in SOS families. Children grow up with their brothers and sisters in a safe environment. Wherever possible, we work closely with the children’s family of origin, so that the children can return to live with them. We provide support while they adjust to living together again. Support for young people: We support young people until they are able to live independently. We give them advice and access to further education or training. Emergency programme: In September 2017, central and southern Mexico was struck by two earthquakes. Over 360 people died in Puebla, Morales and Mexico city and, due to the severe damage caused, many families were affected. SOS Children’s Villages provided immediate assistance. Since then we have carried out a number of activities including restoring homes, providing emotional and psychological support, and running workshops on topics including children’s rights.